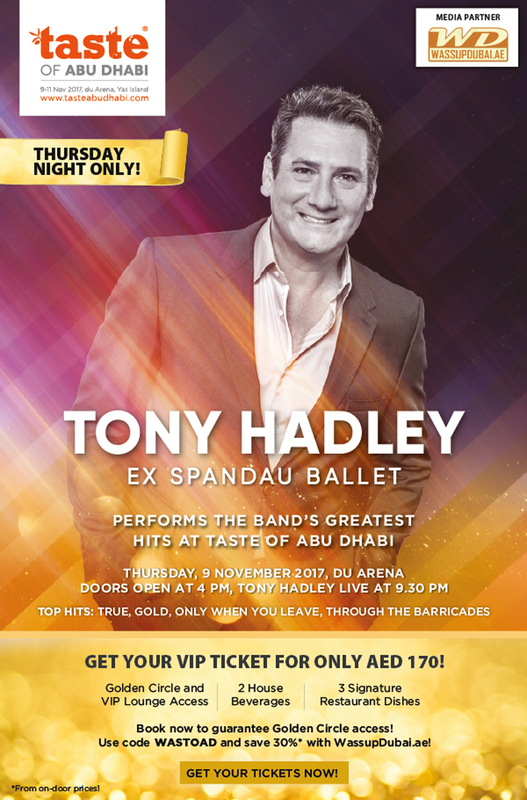 TONY HADLEY Ex Spandau Ballet performs the Bands greatest hits at Taste of Abu Dhabi on Thursday 9th November 2017 at Du Arena, Yas Island. Special discount of 30% on tickets for WassupDubai followers. Book online with promo code WASTOAD from www.tasteabudhabi.com/buytickets . VIP Ticket for Aed 170 includes Gold Circle & VIP Lounge Access, 2 House Beverages & 3 Signature Restaurant Dishes. Door opens 4 pm, Tony Hadley Live at 9:30 pm.